Acupuncture is a technique for strengthening the vitality, natural healing power, and immunity inherent in a person, and is not symptomatic treatment. It is a treatment method that strengthens one ’ s vitality and naturally returns a diseased body back to health. People with strong immunity (vitality) do not easily become ill.
People who regularly receive acupuncture as a health maintenance strategy enjoy good appetite, elimination, and sleep, and do not easily catch cold, which is said to be the "cause of 10,000 diseases". It is easy to catch cold when the body has amassed fatigue and immunity has weakened. 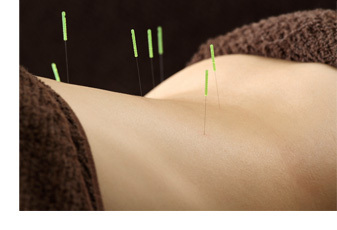 In situations such as these, acupuncture works to minimize symptoms. Disease always occurs when one of the five organs (liver, heart, spleen, lungs, or kidneys) is in a state of deficiency, or in other words a weakened state. For example, problems such as neck, shoulder, and back pain always originate in the internal organs. People who have recently felt irritable or easily upset are suffering from poor spreading function of the liver, or due to causes such as fatigue or lack of sleep are experiencing kidney weakness, which simply manifest as symptoms in the neck and shoulders. Thus it is important to treat these deficient organs to address the root of the problem. Although treating only the affected area is fine for that moment, the problem will soon return. Rather than simply focus on the affected area (painful spot), it is important to thoroughly examine the root cause (five organs). Every person's body is different and unique. The key lies in finding the right treatment style for that person. *Only single-use, disposable needles are used for your safety. ① Regulates blood flow (blood circulation). For example, for people who tend to feel cold, affected areas feel cold due to lack of blood flow. ② Natural substances that suppress pain are secreted. Acupuncture stimulation travels through the nerves to the brain where pain-relieving substances such as endorphins and dynorphins are produced to calm pain. ③ Regulates internal organ function. For example, by performing acupuncture or shiatsu on the acupuncture point known as Stomach 36 (Ashi Sanri in Japanese), the condition of the stomach is improved. Although at first it may appear that the leg and stomach have absolutely no relationship with each other, in fact the autonomic nervous system is engaged to transmit stimulation to the internal organs. In this manner, stimulation of acupuncture points during acupuncture treatment normalizes function of the internal organs. Neuralgia, rheumatism, lumbar pain, frozen shoulder due to age, stiff shoulders, hand and foot numbness, hypertension, headache, allergy syndromes (rhinitis, hives, asthma), feeling cold, hot flashes, whiplash, nervous breakdown, common cold, menopausal symptoms, menstrual pain, hemorrhoids, sprains, physical and emotional fatigue, hypotension, diarrhea, constipation, palpitations, shortness of breath, poor appetite, insomnia, etc. Because the focus of treatment is fundamentally to restore health to the physical and emotional bodies, beauty acupuncture is effective for all symptoms. Beauty acupuncture is effective for rough skin, wrinkles, sagging skin, dull skin, puffy skin (edema), dark circles under the eyes, poor facial color, acne, hives, and atopic dermatitis. 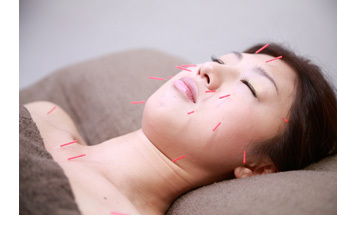 At BodyAnge we use thin and delicate needles for the face, so beauty acupuncture on the face is virtually painless. Come experience not only an angel-like feeling for your body but your heart as well. CopyRgiht（C)2013 Aroma massage, acupuncture, beauty acupuncture, and bodywork for women by BodyAnge All Right Reserved.